In October, I had the honor of being the keynote at the first Agile conference in Tunis in the past 4 years (generously sponsored by Vistaprint). While I was grateful for the opportunity, seeing the number of the attendees from different fields highlighted the attention that Agile was getting in this growing Tunisian economy. I was impressed by the quality of the professionals and students that attended, coming from a range of companies, government agencies, and universities. My keynote was entitled the “Foundations and Future of Agile”. You can watch the session here. I started my session by asking the question, “Who do you want to be.” The intent was to get the audience to consider if they can be more than who they are today and make a commitment to Agile as they approach the future. I followed this up with, “Who do we want Tunisia to be”? I provided a vision on how Tunisia can be the pride of Africa. I challenged the participants to become the leaders in Agile and the customer value drive mindset. To begin the “foundation” portion of my session, I focused on the Agile Values and Principles. I find that too many companies lead with mechanics and forget the mindset of embracing the values and principles. Leading with the mindset will remind people why they are doing agile in the first place. As I shared each principle, one at a time, using a roman voting technique I asked attendees if they believed in each principle. I was pleased to see that there was a strong belief in embracing the principles. 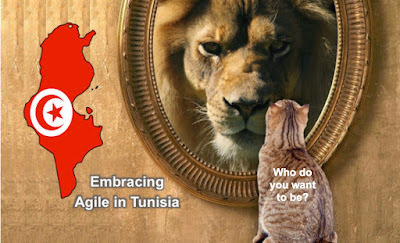 This bodes well for their ability to apply Agile methods and practices and the future of Tunisia. As I moved into the “future” portion, I shared the importance of becoming customer value-driven. I suggest that Agile shouldn’t be done for agile’s sake but instead the goal should be to build a customer value-driven engine. It is the customer who we are serving and who we want to make successful. As they succeed, so will our business. I shared the modern concepts of the enterprise kanban, customer value canvas, cost of delay, story mapping, and customer feedback loops. I wove in the discovery mindset including incremental thinking, psychological safety, and, self-organizing teams. I ended the session by asking again, “Who do you want to be? What is your role in building a greater Tunisia?” With such potential in the audience from everyone I met, I can understand why some companies are already setting up development centers in Tunis such as Vistaprint. I ended with asking all of the participants to make a commitment to explore in more detail one of the Agile concepts or mindset elements they learned today. Almost everyone’s hand went up. This will help make for a better future in Tunisia. I’m looking forward to it! Note: In addition to my session, the conference included a session by Antonio Gonzalez on “The Role of an Agile Leader” and by JP Beaudry on “The Vistaprint Agile Journey”. Special thanks to Nawel Lengliz and Rahma Arfa for coordinating such a great event and to Walid Abdelaziz for sponsoring the event!